Drones have become a very popular aerial device for all ages. They are used for many things such as wedding videography, aerial surveillance, recreational use, mineral exploration, and more. Unfortunately, criminals have taken their use to the next level. Fairmount Park in Philadelphia arrested a 38-year-old man who was supposedly using his drone to look inconspicuous at the park-goers. However, the police determined that his use was for watching those unsuspecting people parking their cars. He then noticed a routine of walking the dog or taking a casual stroll for a certain time frame and would proceed to target the vehicle to break into. “He sees he has an opportunity for about 40 minutes to break into cars. Breaks windows, usually a female’s, gets the license, takes the credit cards, go to the city limits and uses the credit card,” said Lt. John Walker. He had been charged with other burglaries the previous year. Personally, in talking with a friend, they had arrested a gentleman this year in her city who was flying his drone up to car windows, hovering for a few seconds then moving onto the next car. Once the criminal could see that valuables were in the vehicles, he would make his move in the evenings breaking into the cars. Believe it or not, drones have been used for drug drops on prison grounds. Drones would fly overhead and drop the illegal substances in inconspicuous areas in which the prisoner knew to pick them up. Control over this has been maximized at prisons to prevent further aerial drops. One drone in 2015 crashed in a Tijuana supermarket parking lot before 10 pm carrying over 6 lbs of crystal meth. Tijuana police reported that this is the first time smugglers have attempted using drones to pass drugs through the San Ysidro Port of Entry. In New York and New Jersey one particular criminal outfit, the Tub Gang, was identified as using drones to map out burglary targets. Officers confiscated the drones and found stills of residential and commercial properties the criminals had just broken into. This digital footage was evidence of the properties this group had targeted. 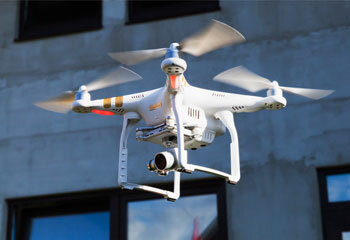 There have been a few cases of personal injury caused by drones. The New York City debut of the much-hyped “Mobile Mistletoe” drones, unfortunately, spilled blood at the restaurants bay location. It got a little too close, hitting a photographer in the face. “It literally chipped off a tip of my nose,” said Benvenuto, using tissues to staunch the blood. “It took off part of my nose and cut me here, right under my chin.” In this case, you would want to “seek legal counsel immediately”, as stated by the well know Nashville Personal Injury Lawyers. Also, any citizen has the right to call the police right away if they suspect a drone is invading their privacy. Check with your local city as some prohibit drones altogether. Just remember to keep your eyes peeled and watch for suspicious activity to look out for our fellow citizens and prevent more crime from occurring.